Ladies' denim self seat breeches with Italian design, silver-colored metal and pearl accents. Stylish and fashion forward with innovative fabric that combines Coolmax, Microfiber & Lycra for comfort. A truly A rated breech, with super soft, stretchy Coolmax fabric & Debbie's subtle touches. Featuring the the Comfort Socks System! UltraGripp knee patches, contrast stitching and 2 front pockets lined with ultra-suede. Soft stretch leg openings offer a perfect, seamless fit underneath your boots or chaps. Taupe contrasting knee patches and CS2 bottom for a comfortable fit in your field boots. Contrasting knee patches and CS2 bottom for a comfortable fit, 82% nylon. Made with Coolmax material to wick away moisture and keep riders cool and dry. These modern style, designer full seat breeches are accented with a contrasting saddle stitch design and dressed up with decorative jewel snaps. These modern style, designer knee patch breeches are accented with a contrasting saddle stitch design and dressed up with decorative jewel snaps. Safari and feature taupe contrasting knee patches and CS2 bottom for a comfortable fit. 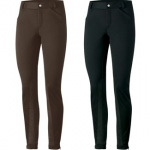 Side zip breeches are sure to be the perfect addition to your show apparel. Features a subtle nautical stripe detailing on the back belt loop. The soft stretch leg opening offers a perfect, seamless comfort, wide waistband, low rise with contrast stitch. With a lowrise, wide waistband and the soft stretch opening of our CS2 bottoms, these breeches offer seamless comfort under your favorite boots or chaps.